Puducherry Chief Minister V Narayanasamy on Wednesday, stepped up his attack on L-G Kiran Bedi, protesting over her autocratic rule after he alleged that she was delaying implementation of government projects. Puducherry: Tensions seem to be flaring up, after Puducherry Chief Minister V Narayanasamy, along with his entourage of ministers, spent the night outside Lieutenant Governor Kiran Bedi’s official residence on Wednesday- protesting against her authoritarian way of governance. 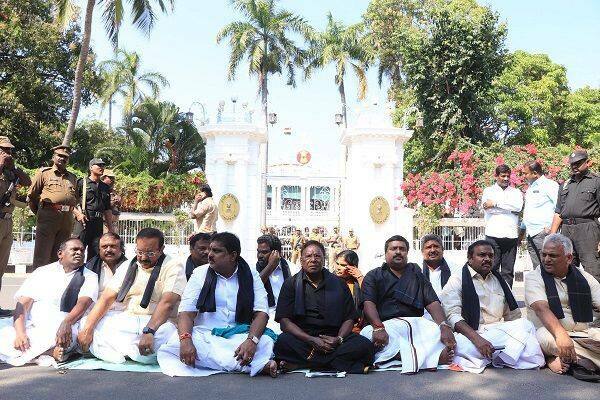 Wearing a black shirt and a black dhoti, the chief minister sat outside the Raj Nivas in Puducherry on Wednesday, agitating against L-G Kiran Bedi for tying to meddle in the government’s day-to-day affairs. He was joined by his ministers and some Dravida Munnetra Kazhagam (DMK) lawmakers. Mounting an attack, Chief Minister V Narayanasamy demanded that she accord sanction for 39 government proposals, including a free rice scheme. Speaking to reporters outside the Raj Nivas, the CM cited various instances, including implementation of the free rice scheme, grants to privately managed educational institutions, sanction of funds for government undertakings and implementation of various welfare schemes for Scheduled Castes, Backward Classes and OBCs which have been allegedly stalled by the L-G though funds have been earmarked in the budget for them. “Kiran Bedi should mend her ways and sanction her approval to our decisions. If she wants, she can contest an election in Puducherry”, the chief minister said. On her part, Bedi on Wednesday evening wrote to Narayanasamy inviting him for a meeting on February 21. The L-G also tweeted the letter she wrote to the chief minister, urging him not to agitate, when the issue can be resolved over a dialogue. She further tweeted how the Raj Nivas was completely blocked by the CM and his troupe of ministers. Today Raj Nivas was totally surrounded by CM and his agitators. None of us could move out or visitors could come in. Also staff too was blocked from returning to office. Puducherry’s chief minister opposition to Bedi’s work comes in tow of the L-G hitting the roads recently, inspecting and urging two-wheeler riders to wear a helmet. The 69-year-old former IPS officer stood on the busy crossing connecting Puducherry and Viluppuram and stopped every two-wheeler motorist who was driving without a helmet. She also further slammed the Puducherry government, saying that Chief Minister V Narayanasamy is sabotaging the enforcement of road safety rules. Law makers or breakers in Puducherry?These elected representatives r agitating against helmet wearing law enforcement. Reportedly, L-G Kiran Bedi wanted the helmet rule for two-wheeler riders to be implemented at one go, while Narayanasamy wanted the implementation in phases. According to a PTI report, Narayanasamy said Bedi’s recent decision to make helmet wearing mandatory without generating awareness among two wheeler riders, as proposed by the government “is a clear case of her going her way and causing harassment to the people”.